New images by photographer Edmon Leong offer a first look at the nearly completed glass volumes of MAD's Chaoyang Park Plaza – a commercial and residential complex based on rock formations in Beijing. MAD's 120,000-square-metre complex of skyscrapers, office blocks and public spaces is located in Beijing's central business district, which sits on the southern edge of Chaoyang Park – one of the largest parks in the city. In building Chaoyang Park Plaza, the architects intended to create a "city landscape" by referencing the lakes, mountains and stones depicted in traditional Chinese shan shui scenic paintings. The project is modelled on Shanshui City, the architectural model created by MAD's founder Ma Yansong for an urban development in Guiyang, China. Yansong's vision is intended to rethink how cities and their inhabitants can reconnect with the natural world. Construction started on the project in 2012 – with the main focus being a pair of asymmetrical 120-metre tall skyscrapers modelled on the natural shapes of rock formations. "Ridges and valleys define the shape of the exterior glass facade, as if the natural forces of erosion wore down the tower into a few thin lines," said the architects. Leong's images capture these bulges and "valleys" of the irregularly-shaped towers, intended to evoke a sense of nature within the cosmopolitan environment. The irregular silhouettes of the two towers depicted by Leong, are formed from multi-level terraces populated by public gardens where people can look out over the city. The ridges are embedded with sustainable technologies, using internal ventilation and filtration systems to draw the natural breeze indoors. MAD's combination of natural lighting, intelligent building and air purification earned the project a gold LEED certificate – one of the highest ratings of the US sustainability rating system. Echoing the curving forms of the skyscrapers, four geometric, plant-covered office buildings located to the south of the towers are intended to resemble "river stones that have been eroded over a long period". A 17-metre-high glass lobby creates a transitional area between the two towers – sounds of flowing water are played throughout the connecting space to "make the lobby feel like a natural scene from a mountain valley," said the studio. The firm's concern with connecting the urban environment with nature is demonstrated by its use of greenery interspersed throughout the towers. 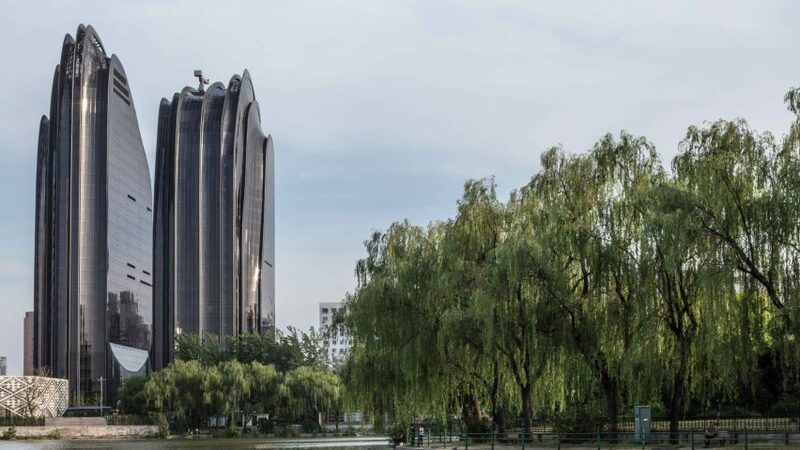 "Unlike typical urban-block developments that delineate the boundary between city and garden, [the] towers appear at the edge of the park as an organic part of the green adjacent space," said Ma Yansong in his book, MAD Works MAD Architects. The Beijing-based studio has also recently completed its Fake Hills development – an apartment complex in Beihai, China, with an undulating roofline that accommodates tennis courts and swimming pools.